Wish You Had An Unbeatable Yet Powerful Competitive Edge On The Market? Then This Brilliant New Script Is EXACTLY The Cutting Edge You've Been Wanting. A SURE MONEY-MAKER WITH UNIQUE CUTOMISATION FEATURES THAT WILL BOOST YOUR BUSINESS INTO THE STRATOSPHERE IS NOW AT YOUR FINGERTIPS! If you've seen, used or simply heard about my Advanced Revenue Sharing script or my Ultimate Matrix Script and witnessed the excitement it generates, then you're going to fall head over heels in love with my most feature-filled script ever to be released! Consider having multiple membership lines that can cycle automatically, give member's advertising bonuses, cash profits and a reliable income... With the added ability of being able to know in advance when a membership line will payout, it gives you that strong competitive edge you've been looking for. Add to that the combined features of 3 popular matrix types including forced matrix, company forced matrix (left to right, top to bottom without any holes), and advanced forced matrix. Now You're Talking About An ABSOLUTE Winner! This is a multi-functional self-sustaining script that has been developed to truly outlast and outperform ALL other scripts on the market simply because members don't need to refer to earn! You choose the settings of your choice to offer to your members -- and wait until you see the powerful features available to you... Talk about a huge range of choices! 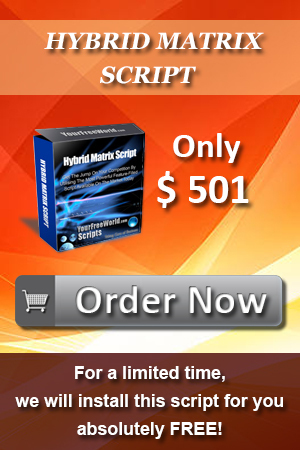 Take A Closer Look At Exactly What Makes This Script Simply Irresistible To Your Site Visitors. The Lure Of High Earning Capabilities With The Incredible POWER Of Matrix Revenue Recycling & Share Positions Is Like A Magnet! Our revenue sharing script is designed to be flexible for the webmaster that wants to create an individual program that stands out from the crowd and last the distance. Even though it comes complete with a modern site template that you can use straight out of the box, it's easy to customise your own head and footer to fit in with your existing web site should you prefer. With so many options available, the functionality is outstanding and is top rate. But not only that... the BIG stand-out attraction for this script is the built-in provision of extreme flexibility to the administrator, allowing them to choose the settings they wish to use. *NEW! * Set to allow direct share purchase or not. Then bonus share positions can be given with any level matrix position purchase. *NEW! * Set to allow direct matrix purchase or not. Then bonus matrix positions can be given with any level matrix position purchase. Multi-Purpose Script: You can install the script on any domain that you own providing more value to your site visitors. With built-in banner and text ad impressions for your members, we've added instant value with quality advertising options for your members. They can also see at-a-glance program statistics on the home page that create a sense of urgency, and encourage them to signup immediately. Business Branding: The excitement generated by this script will make your site 'sticky', and naturally encourage your members to come back to your site time and time again to see how much they've earned. Due to the high activity your site will experience, your brand will gain more trust and instant recognition in the marketplace. Comprehensive Administration: There are so many features that you can customise and control from the management area to suit your business... You have total freedom of choice to set the options, pricing and facilities however you see fit to offer that value to your customers. Automation: We've made it so easy-to-us by automating repetitive functions to save you time and effort, and make the administration of your script much quick and easier than ever. Privacy: Your member list is on your domain and your customer database is only available to you and no one else, ever. What a relief! Reliability: When you host your own revenue sharing script on your site, you will remain in complete control, because you are the one who successfully manages the business, not someone else. Support: If you require support for your script, it is always available reliably 24/7 through our support centre. Enhancements: If you require enhancements to your script, it is available through our development team at very reasonable rates. The Roof While Making A Huge Impact Online That Won't Go Unnoticed? Very easy to install to your web server. Comes complete with sales page already pre-written for you to generate new member signups. Includes full instructions for setting up the Admin area. Set the site name, site URL, and admin login details. Facility to include popular payment processors like PayPal, Payza, Moneybookers, SolidTrustPay and LibertyReserve with ability to add up to 5 extra merchant accounts as desired. Ability to set the payout for each member that cycles through to complete the matrix. Eg. $100. Set minimum withdrawal and deposit amounts. Set withdrawl and deposit fees. Show or hide extra customised fields to signup form such as address, city, state, post code, and country. 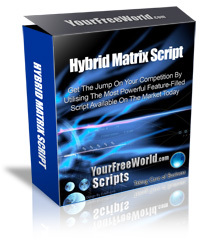 Ability to customise the Powered By YourFreeWorld Scripts link with your affiliate link so you can earn $50 commissions. Set the number of banners to be shown at the bottom of each page, and the number of text ads to be shown at the top of each page. Set yes or no option for sending signup confirmation email, new signup and referral emails to referrer, and earnings email. Customise the emails for confirmation, welcome, referral notification, password reminder, banner ad and text ad approval/rejection, with several personalisation tags. Customise the HTML code for free member and pro member bonuses. Enter the HTML code for the ad purchase thank you, FAQ, home page, logout page, members area home page, and Terms pages. Edit the HTML code of included webpages on the site such as Ad Purchase Thank You, FAQ, Home, Logout, Members Home and Terms pages. View and edit/delete all member details including positions purchased and withdrawal history. View/edit/delete members by membership level - free or pro. View and approve/delete pending members. Manage members by search, active, pending and removed. View the top sponsors in your program. Send an email broadcast to all members, free or pro members in plain text or HTML format with 8 personalisation tags available. Maximum positions a person can purchase at once. Maximum positions a person can own in this line. Number of positions required to purchase entry into a higher line. Admin profit percentage on each purchase. Referral profit percentage down 5 levels. Percentage share to be earned in each position daily. Frequency in days of payout percentage. Total number of shares in each line before it closes. Choose to set maximum profit percentage on or off. Set maximum profit percentage a share can earn. Set reinvestment block percentage to be held to reinvest. Set bonus banner & text ad credits to be awarded on purchase of a line position. Set bonus banner & text ad credits to be awarded on cycling in the current membership line. Enter HTML code for bonus downloads for receiving a line position. Set welcome and cycling notification email contents. View individual line details, including user name, payment mode, amount invested, earnings, purchase date, next payment due date and actions button. View admin earnings from each membership line with payment method, date and amount. See all the approved deposits and pending deposits made. View/add/edit/delete solo ads and banners for affiliates to use when promoting your program. View completed and pending withdrawals, and carry out mass pay function to pay members. Extra mass pay functions included for SolidTrustPay provided. Manually add banners and text ads, and view pending and approved banners and text ads. View approved and pending testimonials submitted by members. View at-a-glance statistics and figures of Total Members, Free Members, Pro Members, Pending Members, Approved Deposit, Pending Deposit, Paid Money, Pending Withdrawls, Approved Testimonials, Pending Testimonials, Total Money Invested, Membership Lines Total, Line 1, Line #2, Total Positions, Your Profit, Members Earnings from positions, Members Earnings by Referral Bonus, Pending Transactions, Promotional Banners, Promotional Solo Ads, Approved Banners, Pending Banners, Approved Text Ads, Pending Text Ads, Cron Status, and Last Updated Sub/Pending ID no. As you can see, there are many extra features that you won't normally find in other scripts, because this is a very high-tech script with complex programming. The user interface makes our script so straightforward that users of any experience level will find it easy-to-navigate after a few goes. Instructions on member's home page. Deposit funds and view deposit history facility. Purchase matrix revenue membership line positions including repurchase from unpaid earnings facility. Manage positions showing statistics of each cycling matrix share. Snapshot of the overall statistics of your account. Promotional center with ad copy and banner graphics for affiliates to use to market your site. Text ad and banner ad setup and statistics. Bonus page where members can download and/or signup to your bonus offers.